Rivaba Jadeja says she's not averse to contesting the Lok Sabha polls and defends the Karni Sena, of which she is a part. 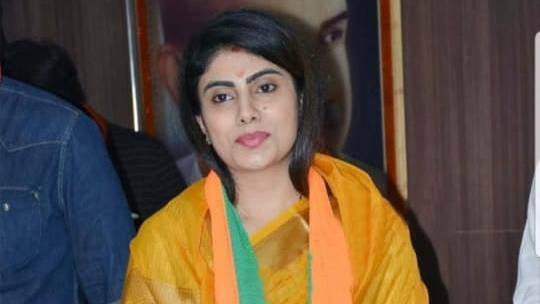 Mumbai: Rivaba Jadeja, wife of cricketer Ravindra Jadeja and one of the Bharatiya Janata Party’s (BJP) most recent recruits, said she decided to join the party as she is impressed by Prime Minister Narendra Modi, particularly after a casual meeting with him last year along with her husband. Rivaba, 29, met the prime minister in Delhi in November last year before her husband was to leave for India’s tour of Australia. Modi had tweeted a photo with the couple after the meeting. Rivaba said that Modi recounted an incident from his early days that particularly influenced her decision to join politics. “He said he once attended a sabha where some people were sitting and criticising the political situation. He approached them and told them that he is still a very small person but can help them get an election ticket if they want to win and solve all the problems that they are complaining about,” she said. “They brushed it aside and said politics is not their cup of tea. Modi sir then said that they have no right to criticise and that if you want something good to happen you have to get involved,” she added. A while later, Rivaba said, the BJP leadership in Jamnagar approached her asking if she was interested in joining the party and she agreed. Her induction into the BJP was a day before Modi’s visit to Jamnagar. She added that her husband fully supported her decision. Another incident that catalysed her decision to join the BJP was that party leaders promptly helped her after she got into a skirmish with a police constable last year after her car hit his motorbike. She had accused him of assaulting her. Rivaba, who grew up in Rajkot, is said to be in the fray for a nomination from Gujarat’s Jamnagar seat for the parliamentary polls next month. The constituency is currently held by BJP’s Poonam Maadam. “There is no question of whether I am willing to contest the elections or not. If the party tells any candidate to contest elections, whoever it is, he or she should be ready,” said Rivaba when asked if she had electoral ambitions. The Jamnagar seat has been with the BJP since 1989 except for two terms — 2004 and 2009 — when the Congress won from here. In 2014, BJP’s Madaam wrested the constituency from sitting Congress MP Vikrambhai Madaam, who is her uncle. This election, Patidar agitation leader Hardik Patel, who recently joined the Congress, has shown interest in contesting from this seat. Rivaba said her ambition while in college was to join the civil services or the defence forces, but it was cut short as she got engaged and married at an early age, and now finds politics as her avenue to do her bit. Five months before she joined the BJP, Rivaba joined the Karni Sena, infamous for its vociferous protests against Sanjay Leela Bhansali’s film Padmaavat, which released last year. Rivaba heads the organisation’s women’s wing in Gujarat. She defended the organisation’s protests against the Deepika Padukone and Ranveer Singh-starrer Padmaavat.